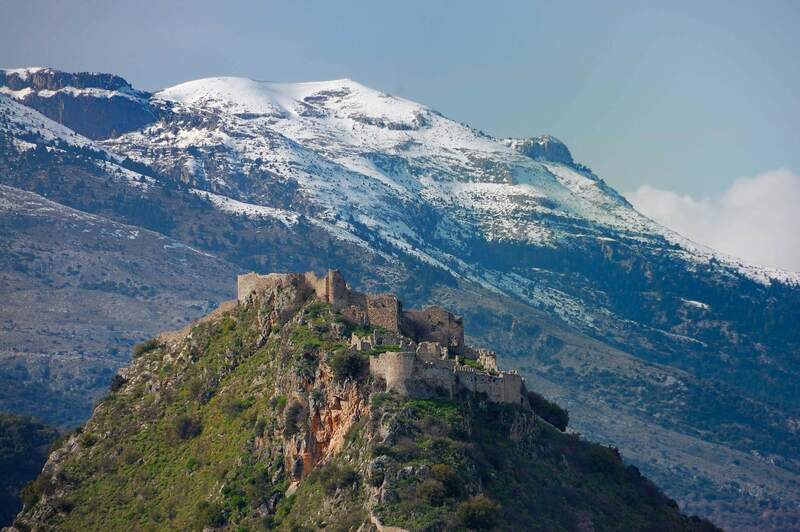 The region of Lakonia is located in the South-Eastern Peloponnese and it is highly privileged to have the cities of Monemvasia and the whole district of Mani into its borders. Lakonia is a peninsula full of sights, monuments, and places of a great interest, so you probably need at least 2 days to travel between villages, cities and all the other attractions. On the first day begin your journey from the capital of Laconia, Sparta. To load some extra strength have a coffee at a traditional “kafeneio”, which is simply the coffee shop in Greece and ask for something local for food like an omelet or another dish. This legendary city in the ancient times used to be a city-state and not just another city of Greece. Huge enemy of Athens, Sparta was the city that gave birth to many mythical and mighty heroes and played a tremendously big role to the political situation in Greece. You should better make a little extra research by yourself before you visit Sparta and so you will be able to understand more about the importance of the city. 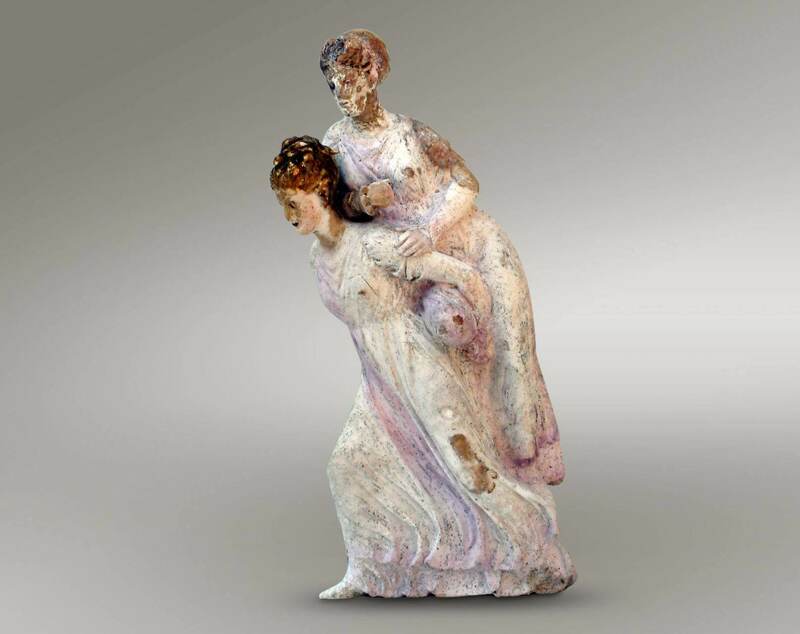 The Archaeological Museum of Sparta is a place full of history and details that will help you even more. A visit there early in the morning is a great start to realize where exactly you are and why every historian speaks so vigorously about Sparta and Mystras region. Another museum you have to visit is the Museum of the Olive in Sparta. Olive branches are the symbol of peace between countries and it is known around the world that offering a branch of an olive tree could mean even the end of a war. This sacred tree is for the Greeks also a mean of trade and exportation through centuries. A tree that grows in thousands of hectares all over Greece and gives a boost to the economy with the high-quality products such as the olive oil, soap and many others. Spend some time there to get the whole picture and get to know with a plant that it is said to give health to the people and happiness. Continue your journey to the countryside and the villages around among the mountains and hills. 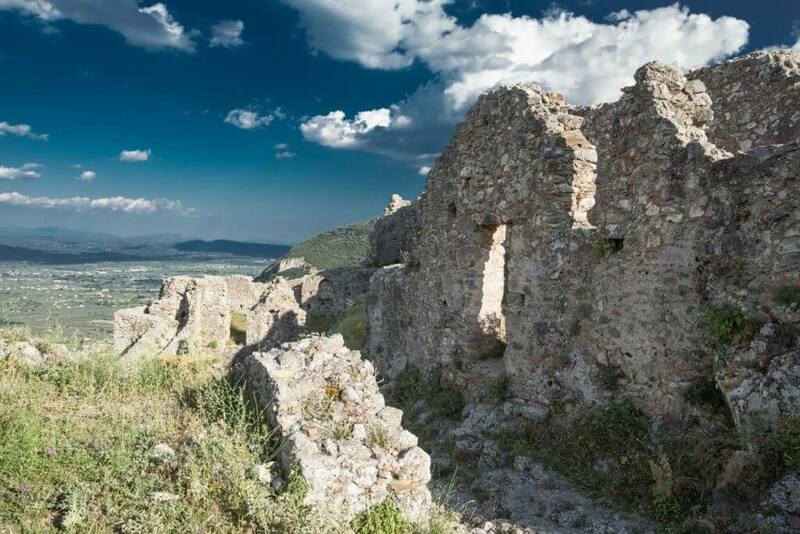 Mystras lays just a few kilometers western to Sparta and it is also a place of great importance. This region is full of castles and stone made villages, beautiful hills and monasteries and Byzantine churches. 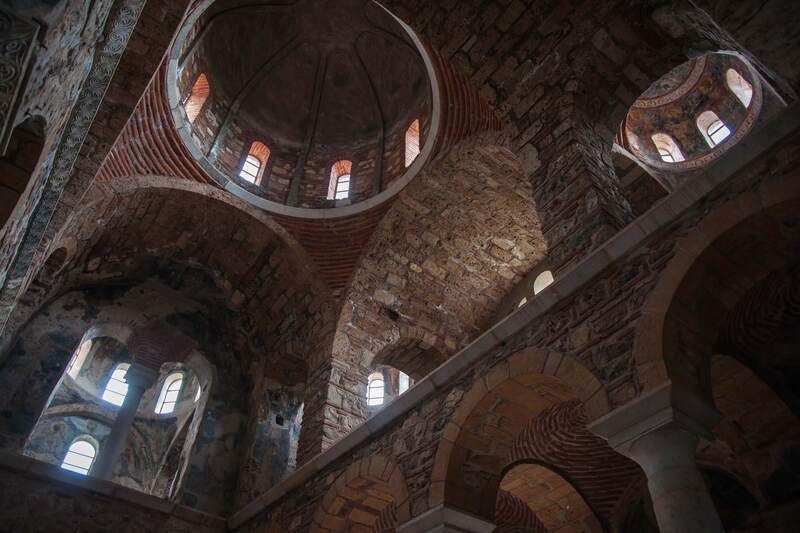 Mystras was one of the most important areas of the Byzantine Empire. The monuments of the area stay silent and have stories to tell beyond imagination, for forbidden vendettas between families and fairy tales and legends of the old times. It is about time to get some rest and as you continue the road to the south you will be close to the sea and the villages there. It is more than the ideal place to have a delicious lunch and gaze at the sea. In these areas, the waters turn into an eerie turquoise shade that you will never get bored looking to. One option is Kourmas tavern in Limeni village. A traditional fish tavern right by the sea with a nice decoration, facing the Gulf and the surrounding area. Fresh seafood right from the Aegean waters and a friendly staff will serve you the best of Mani. One other option is Elies restaurant. With a yard full of small pebbles and flowers you can gaze at the sea from above to this local food restaurant, and enjoy a delightful meal made with love and care. After you have your lunch, continue your trip by following the main road and go to Areopolis stone village. There is a very picturesque round square in the middle of this small town, where according to the Greek history, the revolution against the Ottoman began in March 1821. Wander around the stone buildings and the traditional house yards and have a Greek coffee in one of the cafeterias with the locals accompanied with a fruity “spoon” sweet (fruits like cherries in thick syrup) or a traditional “loukoumi” (gummy sweet in cubes that comes in various flavors). The most visited attraction in the area is, though, the Diros Caves. Very close to Areopolis, about 20 minutes far, Diros Caves has been formed of stalagmites and stalactites through the years and is a magnificent sight to observe. With a total, appreciating length of 6.500 is a wonder of nature that the experts still do not know where ends. If you are eager to know some more about the Caves, then visit the Neolithic Museum of Diros which is full of exhibits from the Neolithic time and plenty of findings from the Caves through the ages. Your final destination for the first day is your accommodation in the area. There are plenty of amazing choices and hotels that reach out the highest level of hospitality. The hoteliers are professionals who always are in search for the best and therefore every year become better and better. One excellent choice is Citta Dei Nicliani. One of the best Peloponnese hotels hosted in a building designated as an Ancient Monument under the 5th Ephorate of Byzantine Antiquities. Fine cuisine, extra services, and the ultimate relaxing environment. Also, Kyrimai Hotel is an amazing building with 5-star facilities, an external swimming pool for the summer and perfectly located in Gerolimenas village. For the evening, after having a bit of rest, the village of Gerolimenas for dinner is a graphic spot for a calming night and chill out next to the sea in one of the peaceful taverns there. Day two and it will be wise if you take your tasteful breakfast very early in the morning and then drive to Porto Kagio and then to Cape Tainaron. This is the southern spot of Greece’s mainland and the lighthouse there stands for centuries warning the sailors for the danger of the land. It is the ultimate spot to watch the sun rises, hearing nothing than the waves of the Aegean Sea gazing at the superiority of nature. Take your time and breath deeply the sea breeze and after you feel ready to take off, follow the road that leads to Gytheio. A small village by the sea with the colorful houses that reach the port and unique fish taverns across the seaside. This historical village is till today the main port of Mani area and Lakonia peninsula. You can spend a couple of hours walking to the port and have a fresh juice by one coffee shop or a quick snack like a fresh salad (Saga restaurant). Watch the fish boats drifting slowly by the waves and observe the everyday life of people that have spent all of their lives in a calming, “slow-motion” mode. As you leaving beautiful Gytheio you will be led to the road next to the sea and to the north so you will be by noon in Monemvasia. 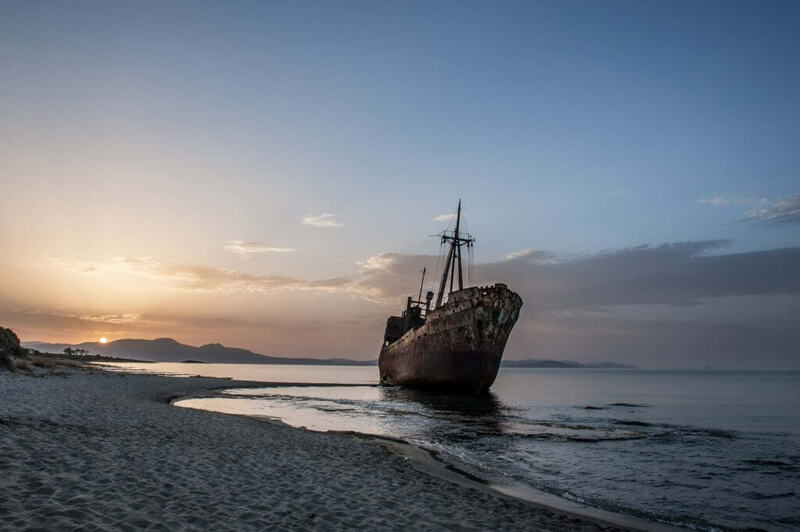 Before that, though, you are passing by many beaches of original beauty like Valtaki beach with the famous shipwreck on its shore with many many stories follow its name for decades now. 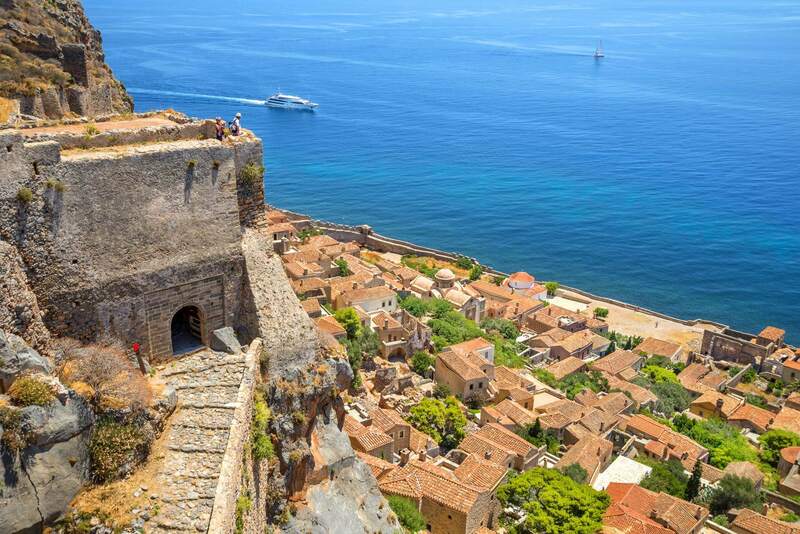 After 1 hour and a half approximately, you will reach the town in the rock, Monemvasia! You can book a night here in one of the glorious hotels built in old mansions and manor houses with the unobstructed view of the sea. One very nice suggestion may be Likinia Hotel with traditional architecture combined with high-quality furniture and services. As a second choice, there is Byzantino Hotel. The hotel offers its guests a relaxing break with a spectacular terrace overlooking the sea. The stone is the dominating element in this town and you can have a long walk around it watching the different colors and architecture of the houses for several hours. Leave for the end the Castle of Monemvasia from where you can have a very nice view to the town and the Aegean Sea. For lunch, there is not a better place than Monemvasia to taste genuine Peloponnesian delicacies and plates full of taste. Try Chrisovoulo Restaurant & Bar, a place with a breathtaking view to the sea and tables right next to it will make you feel fortunate to be there and a part of all that magic. Also, Kanoni with its wonderful veranda up on a roof and between the rooftops of the other beautiful buildings, serve everyday mouth melting recipes and all with fresh and carefully chosen ingredients, a characteristic feature of Peloponnese restaurants. 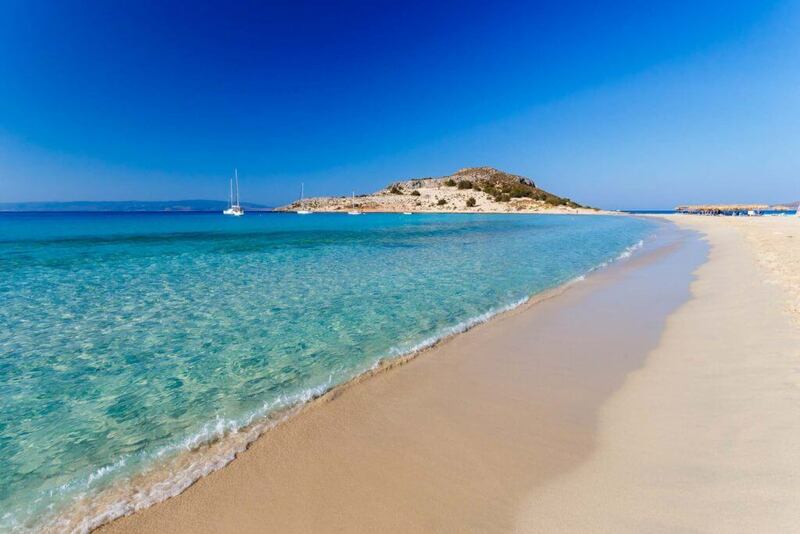 Early in the afternoon, an ideal hour and a perfect suggestion to end your trip in Laconia is Elafonissos island. Located on the southern spot and having one of the most famous beaches in Greece Simos with the turquoise and crystal clear waters, will steal your heart away and will make you believe that miracles indeed happen. At night before you go to get some serious rest, you can have a drink by the town’s stone walls under the light of some candles or in the town’s center under the Castle. Enetiko Castle is one very good choice to close your night by the sea and with the company of soft music and the night stars. Let yourself go and try to live to the most of it this unbelievable experience during this you will learn history, will have a lot of fun and will take some “too good to be true pictures” that will carry with you always.